When we released our ‘musicians wanted’ video for the Chi Might Project in summer 2015, Alan Roberts was one of the first musicians who contacted us to confirm he’s in. We were amazed how many experienced songwriters and musicians agreed to be part of the adventure. And what a nice guy he is! 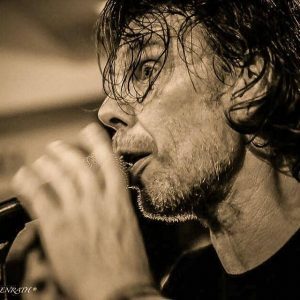 My name is Alan Roberts and I am singer with the legendary band Blah Blah based on the Cote d`Azur in France where for the last 18 years I have been entertaining both the local French and the vast amount of tourists who flood this place every summer. I started in music as a drummer playing rock and jazz for 20 years before I started to sing and landed the job of Blah Blah`s singer. I have been writing songs for many years and have collaborated with a plethora of artists over the years and so was very happy to stumble across Sina`s request for songs on the internet. The song she chose to perform, Honeydrip I wrote 25 years ago and has only been recorded as a demo on my 4-track cassette machine back in 1991 (before Sina was born !!!!) Sina used that demo as a backing track to record this version and I am so happy to be involved with this inspirational and truly international project. I hope one day to collaborate further and to eventually meet all involved in person !!!! Alan booked a studio in Southern France and recorded his part – about 3 years ago, in autumn 2015. So far so good. But at the very next day (I think) the Studio was flooded and fully destroyed, including electronic devices and the recording was lost too. Before Alan could have another try, the studio had to be re-built, so the whole project had to be postponed for a couple of weeks.